How to Choose the Correct Projector Screen? Home theater buyers have a tough task when choosing the proper projector but they have tougher and more important decision to choose the proper projector screen. The home theater screen decision has many branches in the decision tree. To make the correct decision you will first have to ask a couple questions of yourself before deciding on what screen to buy. These questions are the following. What types of media do I watch the most of TV or Movies? How far do I plan on sitting from the screen? Where will I put the front speakers in the set up? Will I be watching media with the lights on? What projector am I using? What type of room? Is it dedicated or dual use? These are the key questions to consider. If you plan on watch HDTV more than movies you should plan on getting a 16:9 screen which is the native aspect ratio of most projectors for home theater. If you are a movie buff than you might consider a 2:35 to 1 screen (this screen is very long rectangle) which is aspect ratio of most blu ray discs. If you go with 2:35 to 1 screen you’ll need a projector that can handle the different aspect ratios by maintaining a constant height on the screen. The seating area distance from the screen is the key question on choosing what size screen you can put in your room. Most people are most comfortable viewing images from about 1.5 to 2 times the screen width. At HTmarket.com the biggest issue we see if with people choosing their size screen is they have a tendency to choose too big of a screen for the size room they have. Most home theater rooms allow for the buyer to place speakers below and to the sides of a screen this enables you to choose a screen for the best video versus speaker placement. If you have to place speakers behind the screen you will need to choose an acoustic screen that allows this to happen but image quality can suffer as a result. If your room is going to be dark 90% of the time without light you can go with a 1.0 gain screen. If you prefer to add brightness to the screen you will want to look for theater screens that offer more gain. A 1.3 gain screen will allow you to have up to 30% more brightness on the screen. HTmarket offers movie projector screens with these characteristics. The projector you buy also factors in your screen decision. Is the projector bright? does it have adequate contrast? The budget you decide on to allocate for the screen will factor in your decision process on what you can afford. Last but not least, is your room dedicated to home theater in this case you will want to look for a fixed projector screen. If it’s dual use you may consider an electric projector screen that retracts into the ceiling that requires electricity. The great thing about choosing a screen is that you can customize what you need to your room. HTmarket.com offers 100’s of screen sizes and selections to choose from popular brands like Stewart, Elite, Dalite, Grandview and Draper. If you need help be sure to visit our web site and call us. 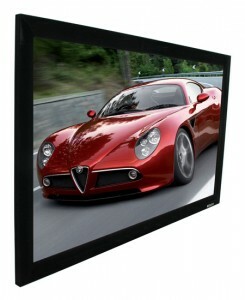 We know projector screens real well and we can help you decide the best course of action.